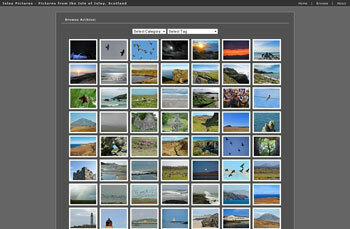 Back in December 2008 I created my first database and installed the software for my photoblog. 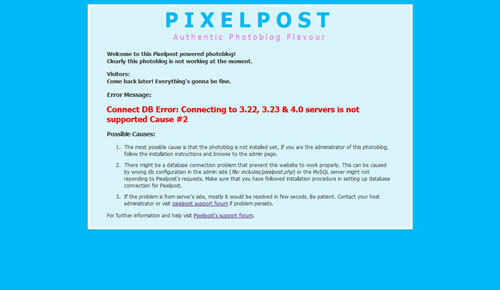 The software was Pixelpost, back then as far as I know a very popular tool for selfhosted photoblogging. It did almost exactly what I was looking for, after only a handful of tweaks (mainly for the design) I had it the way I wanted it. 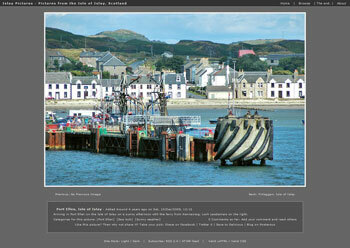 My goal was a picture each day, a goal I pretty much achieved, hitting the 1000 Islay pictures mark in November 2011. I very much enjoyed working with it and along the way I hope I made a few people happy with my pictures. Here's the background: Last week I received an email from my webhoster, informing me of an upcoming upgrade of the server environment from PHP 4 to PHP 5.4. Not a bad thing, on the contrary. However, it causes me a problem. Pixelpost doesn't work on PHP 5.4, as unfortunately the software has now become rather old and has essentially been abandoned by the original developers. While I could nurse it through the next few weeks it definitely would stop to work in April. And while I've got the basic skills to run the software I don't have the skills to change and update the scripts to run under PHP 5+. So I've made the decision to move on. And do it now, not wanting to create more history which will almost certainly be lost. I've decided to start from scratch, using the popular Wordpress, my hope is with it being so widely used the risk of coming into a similar situation like now is rather low. It doesn't do exactly what Pixelpost did, but then again it might be good to try a few new things. I've decided to make a hard cut and start from fresh, even though that means I'm essentially going to lose four years of history. It will look a bit different, but the basics will be the same, in particular me post (at least) one picture a day. I'm planning to post a mixture of ‘old’ (i.e. pictures previously posted on the original blog) and new pictures (i.e. pictures I haven't posted before). The picture size I'm planning to keep the same, i.e. 1,000px wide or high, depending on landscape or portrait format. It might look a bit funny at times while I'm building it over the next few weeks until I'm happy, but otherwise you should be able to just go to the Islay Pictures photoblog for a few pictures.